What could be more exciting or magical than a unicorn party? These mystical creatures are the ULTIMATE choice for birthdays and celebrations! Get ready for your unicorn day with show-stopping unicorn party food ideas that will blow your guests’ socks off! 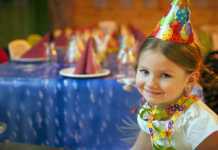 Your main criteria for unicorn party food is colour – bright, bold and rainbow are all good. Add in some gold elements where you can, as well as the all-essential glitter, sprinkles, and sugary sweetness. 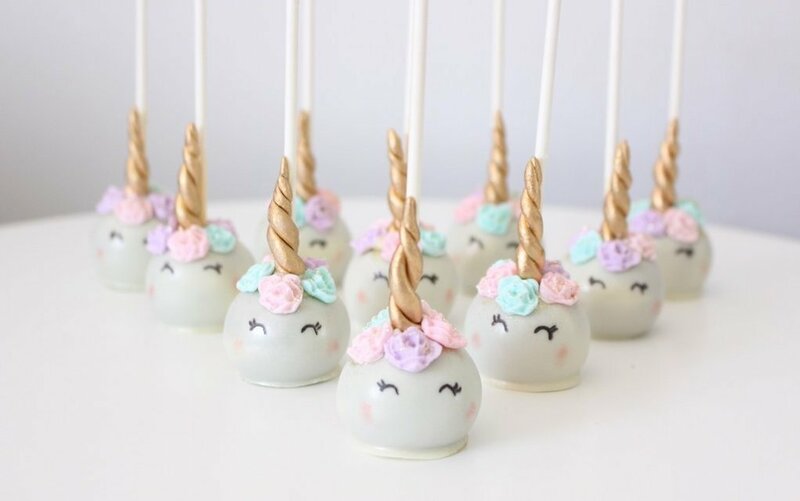 From unicorn cake pops to pooping unicorn cookies, you won’t be short of ideas with this list! With a combination of candy melts and food colouring, you can create the perfect unicorn party food! 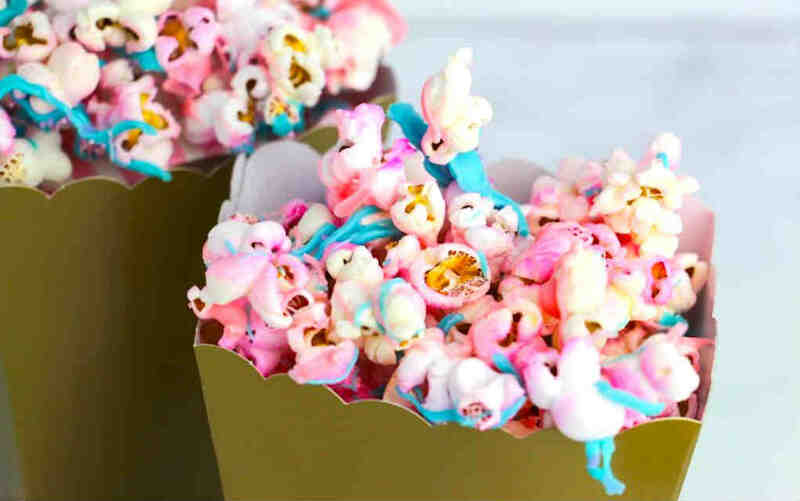 This quirky popcorn from Life Love Liz works well served in big bowls on the party table, or bagged up as party favours for the kids to take home. Take a bite of the rainbow with this absolute colour bomb of a treat! 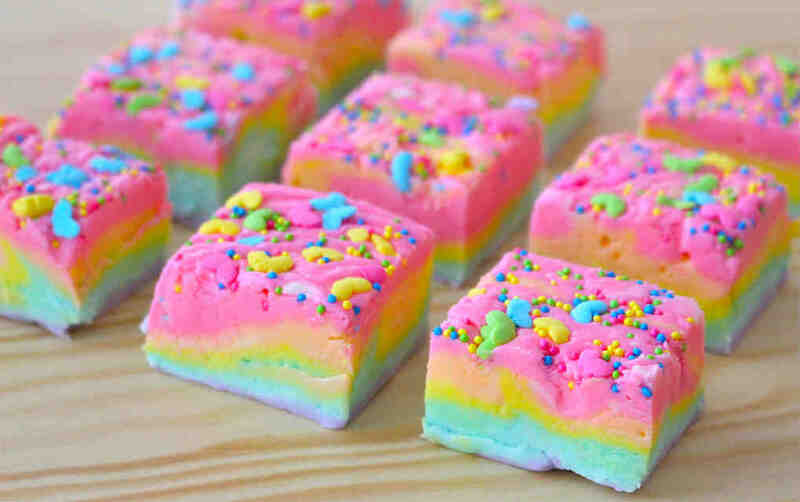 This rainbow fudge from Tastemade certainly fits the brief for vibrant and ethereal – and the bite-size squares are bound to be a success with kids of all ages. 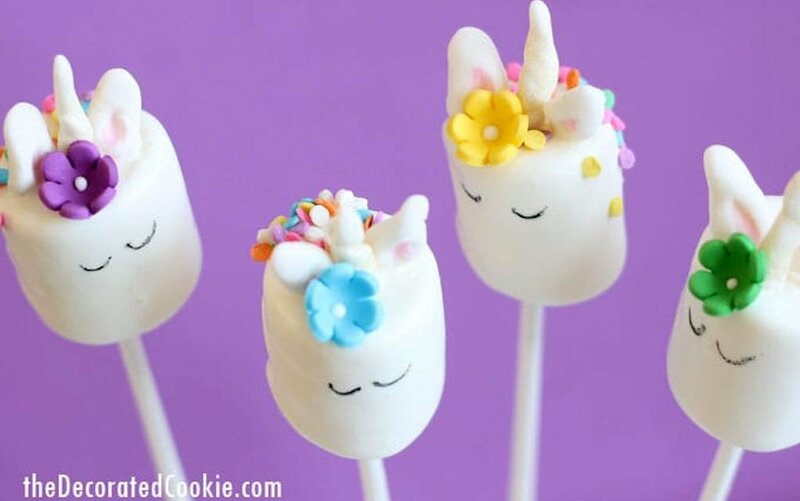 Unicorn marshmallow pops make the world more magical – it’s as simple as that! Look at how cute this gooey treats are. 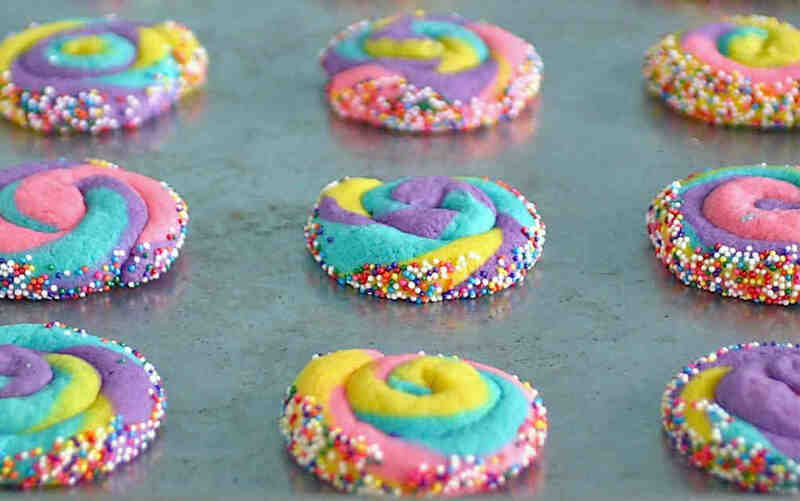 The Decorated Cookie has step-by-step instructions with video included, making this the perfect unicorn party food idea. I actually squealed when I saw these – how could you even eat them, they’re way too cute! Just Add Sugar’s detail on these is gorgeous, but achievable for making at home. 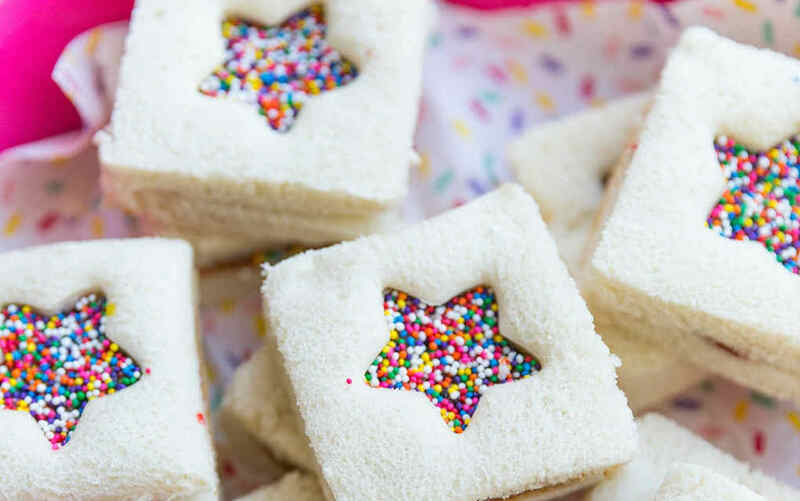 We knew these as fairy sandwiches when I was little, but they would work just as perfectly as a unicorn party food idea. The cut-out can be anything – a star (like this one from Pizzazzerie), heart, initial or number stand out well – and multi-coloured sprinkles like traditional hundreds ‘n’ thousands work best. 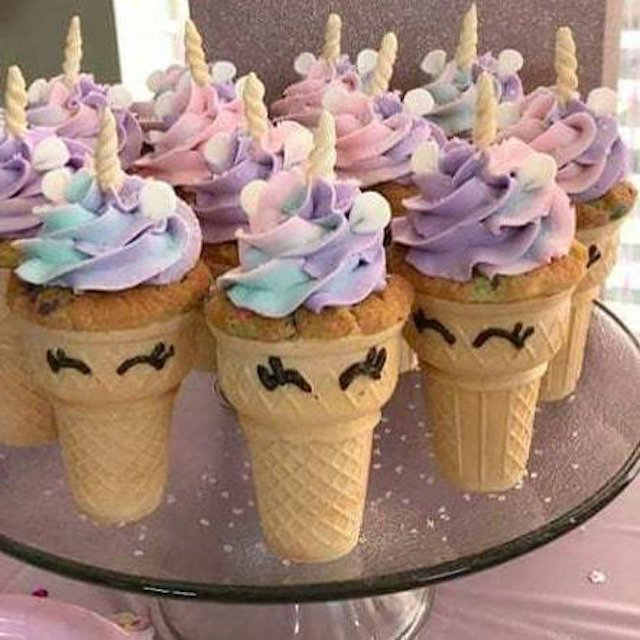 Kids (and adults) will love these unicorn cupcake cones from My Heavenly Recipes – they are ideal for parties, bake sales or just a weekend treat! 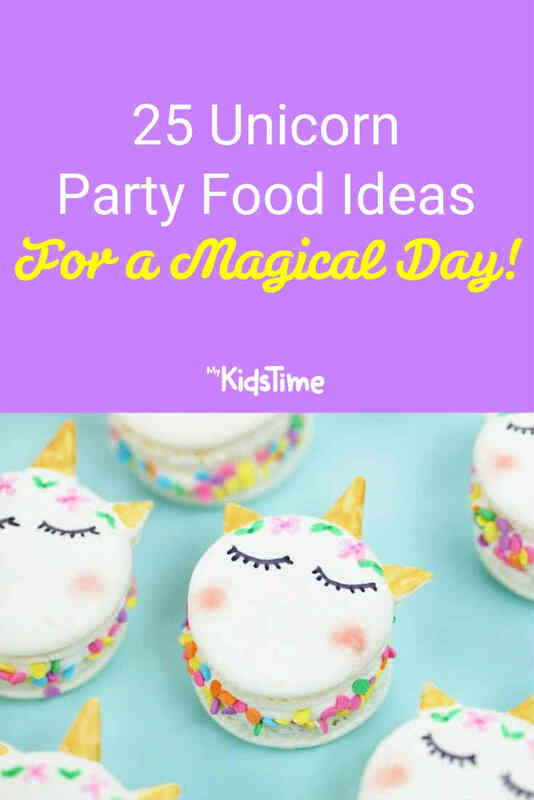 We love this idea from Kara’s Party Ideas for all birthday parties in our house, unicorn-themed or not, and they are universally popular. 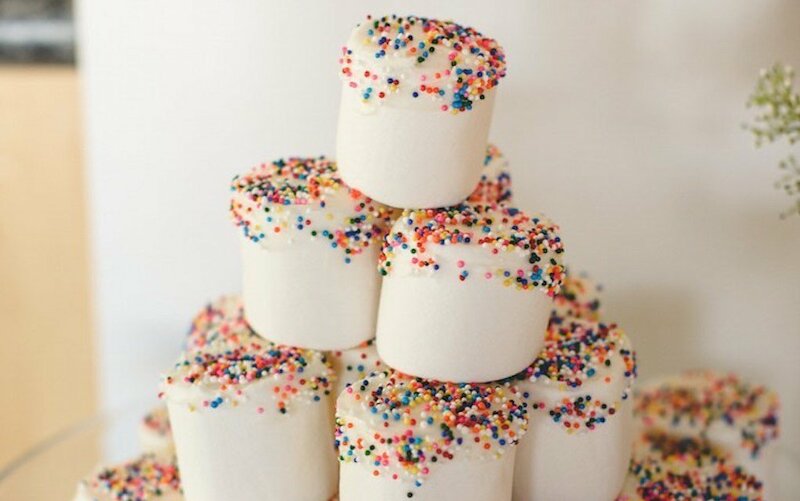 Dip marshmallows in melted white chocolate or candy melts, then dip into a bowl of sprinkles. Place standing upright in a tray and chill to set. A word of warning – these are VERY more-ish, so make more than you think you’ll need (we have quite a bit of ‘taste-testing’ in our house!). 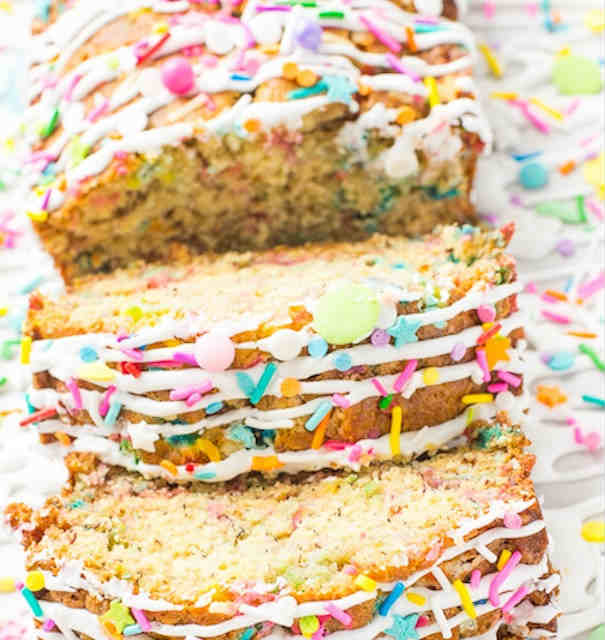 Another classic with a unicorn twist is this banana bread from Deliciously Sprinkled. If you don’t bake it for the unicorn party, what about for your next coffee morning or bake sale? 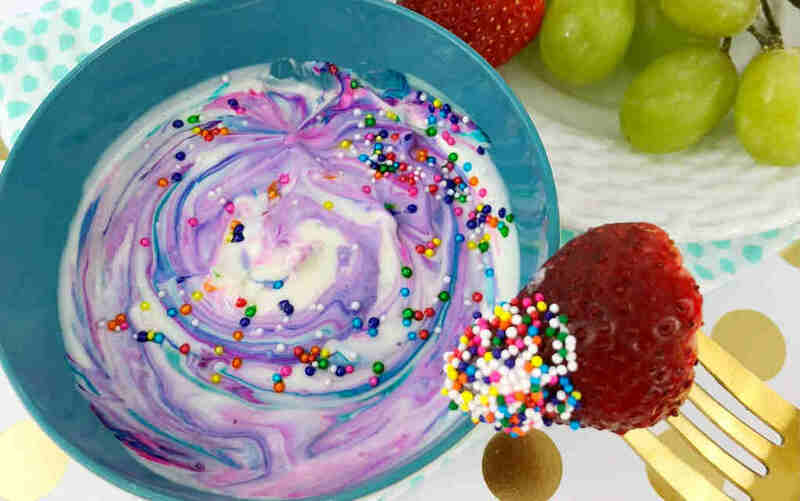 Set out a platter of kid’s fruit favourites like strawberries, bananas, grapes (and maybe a few marshmallows) with this colourful dip from Just a Little Creativity. The creamy taste is definitely popular, and the addition of fruit to the colourful party table will make you feel infinitely better about all the other sugar treats! Pick up a unicorn cookie cutter (like this one from Amazon) that can transform even the plainest sandwich into a real magical beast! These taste great – but, more importantly, just the idea of ‘unicorn poop’ will entertain the kids no end! 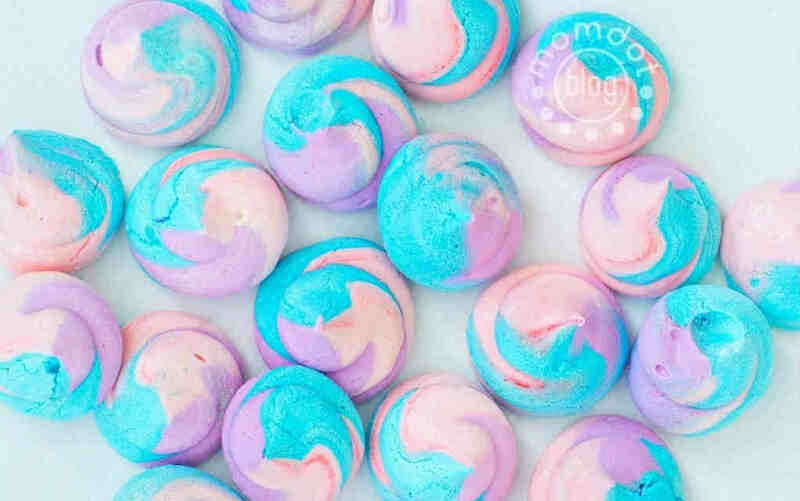 Swirl together your chosen unicorn colours to create bite-size meringue treats, with lots of great tips from Mom Dot. White chocolate unicorn bark is the treat you’ll soon be making for every birthday, bake sale and coffee morning. Follow instructions on Sarah’s Bake Studio to melt a variety of coloured candy melts together, then swirl them to mix the colours and top with sprinkles, edible glitter and confetti spots. Chill and break into pieces. 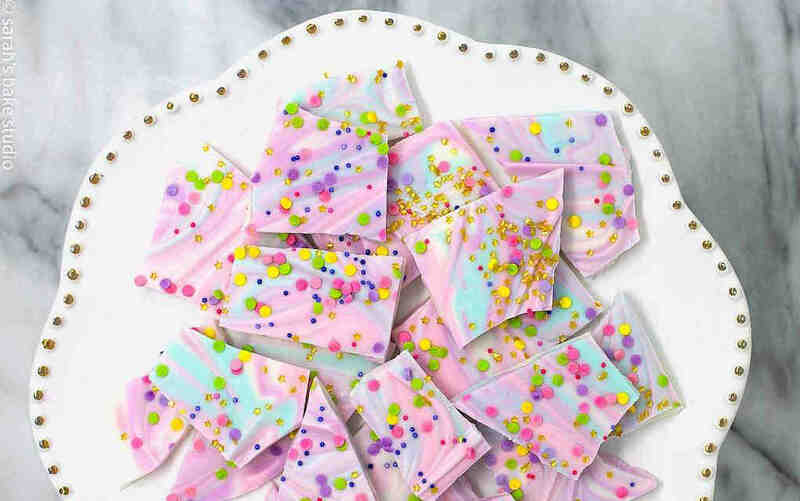 The mix of colours, size and decoration make these shards of unicorn bark an unexpected treat! 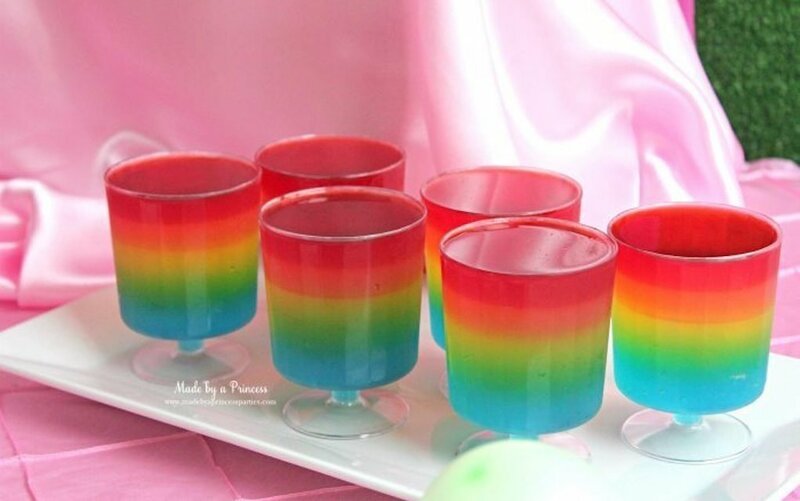 Layer up different colours of jello to create a rainbow of wobble! Made By a Princess shows you how to perfect the layering. You could make individual servings, or create one big glass bowl of wondrous wobble for the kids to enjoy. Deliciously Declassified made these bite-size pinwheel cookies in the most vibrant unicorn colours. They are soft and squidgy with a crunch from the sprinkles, making sure they taste as good as they look! 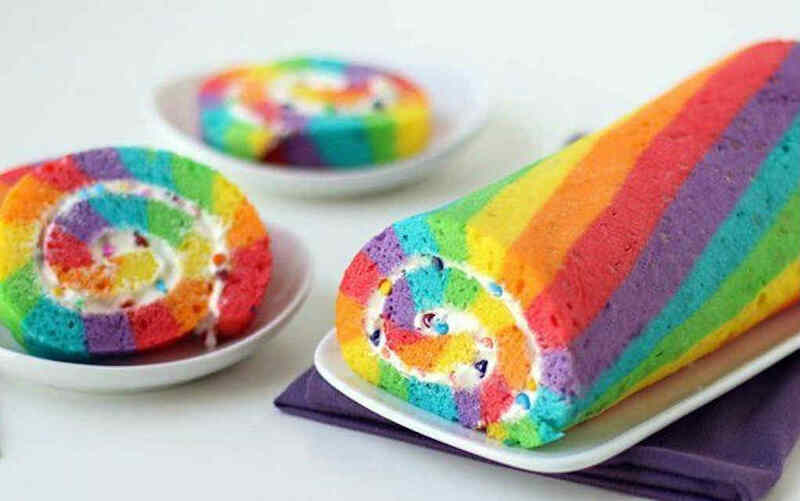 We all know rainbows and unicorns go hand in hand, so this rainbow Swiss roll would be perfect to serve at a unicorn party. While this recipe from Tbsp uses a box cake, any Swiss roll recipe, coloured and cooked the same, would work just as well. Better still, you can watch the video on how to prepare and roll your cake. 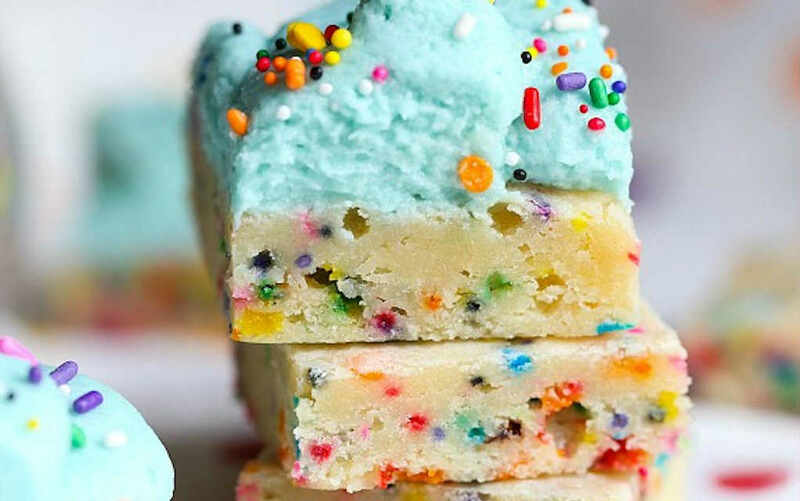 These unicorn bars from Cookies and Cups are like a little ray of sunshine! A buttery and sprinkle-filled sugar cookie bar, topped with clouds of buttercream and yet more sprinkles – what could be wrong with that?! 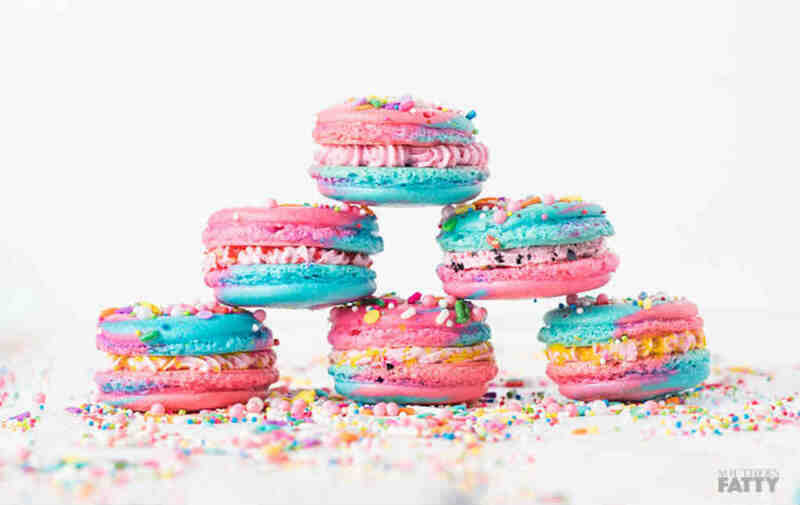 Southern Fatty came up with a great idea – unicorn macarons in a pink-blue swirl, topped with as many sprinkles as you can find, and filled with…wait for it…cotton candy buttercream! 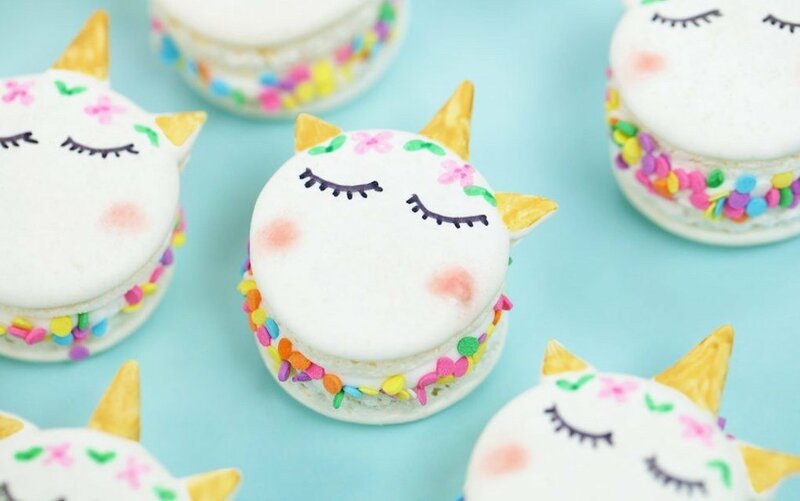 If the unicorn colours above aren’t to your taste, but you want to create those little French bites of wonder, try these adorable macarons from Rosanna Pansino. They are delicate and – just look at those lashes! 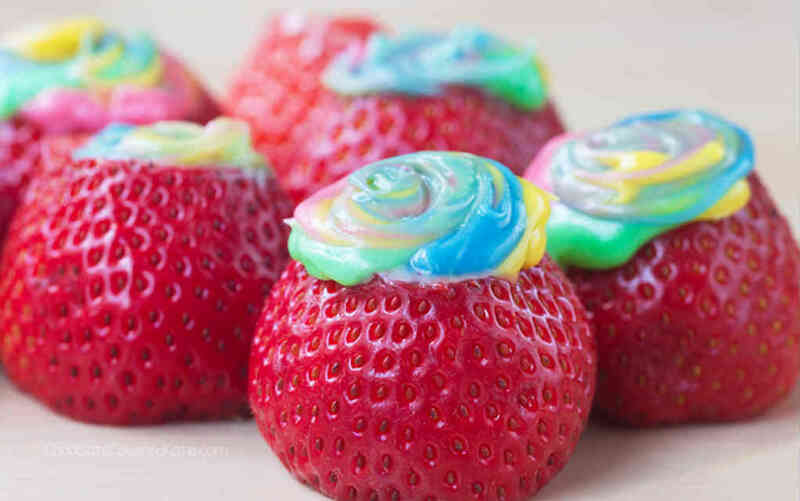 Not only do these stuffed strawberries from Chocolate Covered Katie add some colour to your party table, but they are a welcome reprieve from all the sugar (sort of). These chocolate-covered pretzels in unicorn colours can double up to make great unicorn party table decorations – just stand them in jugs or tall glasses along the table to get the full effect. Just look at their little faces! 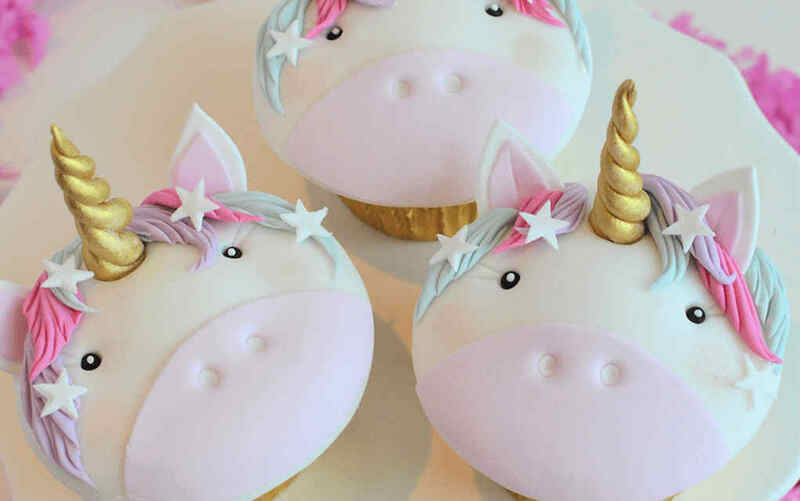 These showstopping cupcakes, as seen on Party Delights, will go down a treat at any unicorn birthday party – even though they’re almost too good to eat! This is like a unicorn ice cream float! 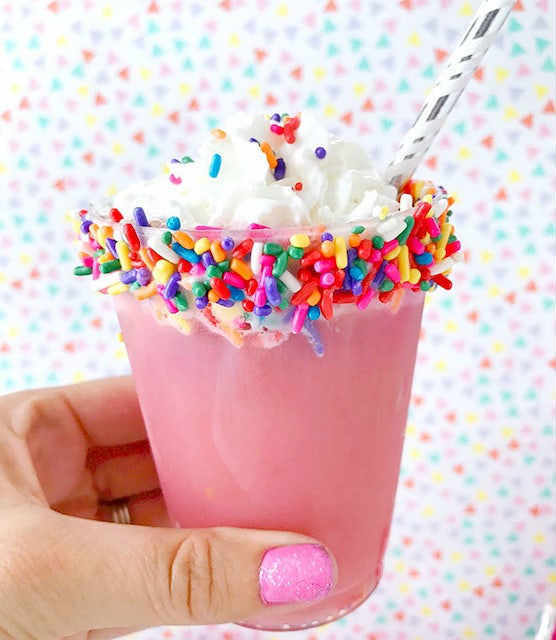 Fizzing sherbet, lemonade, candy melts and sprinkles are what you need to create 100 Directions’ rainbow unicorn drink. You may think you know how to make hot chocolate, but have you ever created something that looks like this? 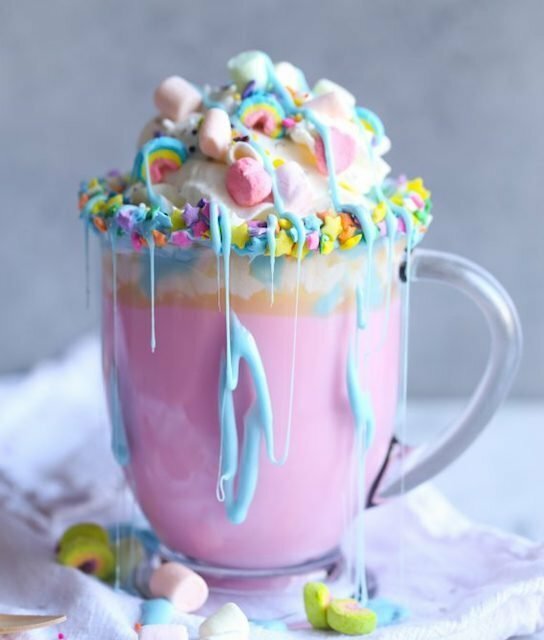 Cookies and Cups transforms the traditional into a white hot chocolate, coloured pink, with sprinkles, whipped cream and mini marshmallows. This is the ULTIMATE in unicorn party food – can you imagine the kids’ faces when they get a pooping unicorn cookie?! This video from My Cupcake Addiction will show you just how to recreate her amazing cookies for your unicorn party. You May Also Enjoy Magical Unicorn Pancakes – The Recipe You Never Knew You Needed! 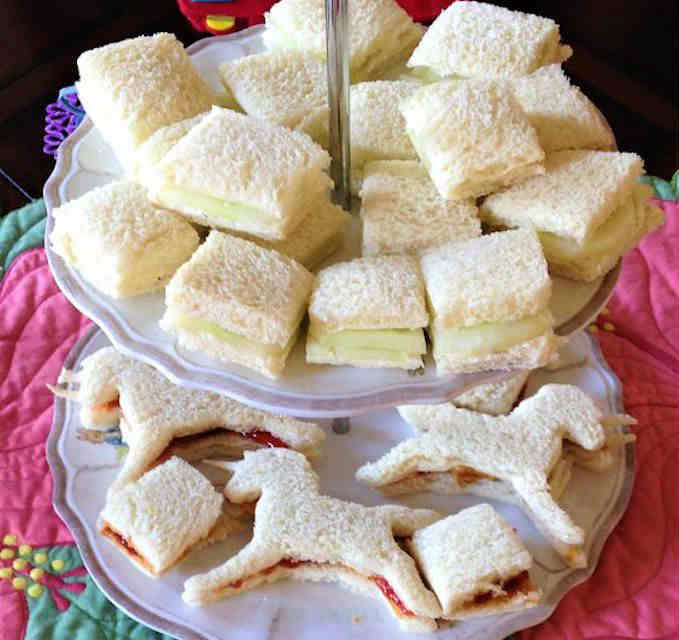 Are you on the hunt for unicorn party food ideas like these? Leave a comment below and let us know – we’d love to hear from you!